What if there was an underlying universal language that encompassed everything in your reality but you simply were not aware? What if you had been led away from this truth as a child? Would you want to know? What if you could find a way to rediscover your connection to it and in doing so could change your whole perspective on life and your powerful place within it? I have been given a unique opportunity to discover such a language and with this opportunity, have challenged myself to find my own truths about life. 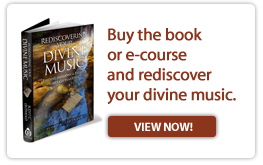 I've dug deep for answers and unearthed profound realizations about our reality and our connection to all things in my new book Rediscovering Your Divine Music. The words of American Transcendentalist writers such as Ralph Waldo Emerson and Henry David Thoreau, as well as naturalist writers such as John Muir, have offered me truly inspiring perspectives. With these perspectives came the revelation that we can find peace and balance in life through our rediscovery that we are instruments of the universal orchestra playing Nature's grand symphony. Rediscovering Your Divine Music has the potential to change countless lives and bring forth a new level of peace and balance in our world through sincerity, compassion, forgiveness, and love. Countless individuals of all generations have felt the heavy burden of life challenges in the past several years. In a world where negativity has become all too common and outward material focus has failed so many returning significant hardship, my book offers a new outlook on the value of the journey inward - with it can come a sense of balance and peace. Through significant philosophical conversations with spiritual leaders, scientists, researchers, and philosophers from around the globe coupled with my own life experiences, I've gained new perspectives on my reality. In my book, I share a timely message that we must reconnect with our natural world and learn to love and respect ourselves, everyone, and everything under the premise that all is one.